The Good, The Bad & The Queen is a band comprised of Damon Albarn, Paul Simonon, Tony Allen and Simon Tong. 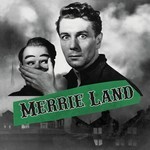 Following an eleven-year hiatus since their eponymous debut, the four musical storytellers are back with Merrie Land. Produced by Tony Visconti and The Good, The Bad & The Queen, Merrie Land contains 10 new songs, written during the current period in which the UK is preparing to leave the European Union, creating a reluctant goodbye letter, a series of observations and reflections on Britishness in 2018.